This peaceful baby girl had her newborn portrait taken at her home in Mount Lebanon, Pittsburgh. This newborn portrait session was carried out in winter so an indoor location was a must. I do not tend to use props in my portrait photography, but instead encourage my clients to include a few of their own items to make their shoot unique and add their own personality to the photos. 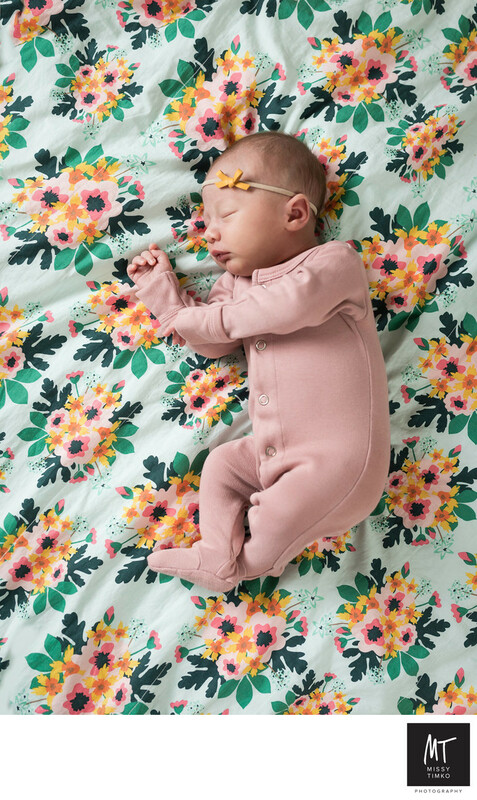 On this occasion, mom choose a subtle orange bow and delicate pink footed romper, which perfectly complimented the pink and orange tones of the floral fabric. By scheduling your newborn photography session in the first two weeks, I am able to get a lot of these really simple and natural photos.